CBSE CTET Admit Card 2016: The Central Board of Secondary Education (CBSE) is going to release the admit cards for Central Teacher Eligibility Test (CTET) on August 17, 2016. The exam is scheduled to be held on September 18, 2016, on their official websites ctet.nic.in and cbse.nic.in. As per reports, over 7 lakh candidates had applied for this Central Teacher Eligibility Test (CTET) which is held twice a year once in February and once in Septemeber. CTET Admit Card contains exam venue and timing, candidate details, and other important information. Check out the below article to download the CBSE CTET Admit Card (Hall Tickets) September 2016 Exam according to Name Wise and Date of Birth Wise. CTET 2016 will be held on September 18 in two shifts. The paper I will be held in afternoon shift between 2 pm to 4:30 pm and paper II will be conducted in the morning shift between 09:30 am to 12 noon. The admit cards will remain available at website until the date of examination. In case any candidate finds any discrepancies in his/her admit card, he/she must contact the CTET office regarding the same in due time. Here is the steps to download CBSE CTET Sep 2016 Admit Card by Name Wise and Date of Birth Wise. Click on CBSE CTET Admit Card September 2016. The hall tickets will appear on the screen. Paper 1 will be for an aspirant who wish to be a teacher for classes 1 to 5. Paper 2 will be for a candidate who wish to be a teacher for classes 6 to 8. A person who intents to be a teacher for both levels (classes 1 to 5 and classes 6 to 8) will have to appear in both the papers (Paper 1 and Paper 2). Paper 1 – 2.00 pm to 4.30 pm. The candidates have to report at the examination centre 90 minutes before the start of the test. The candidate report after 9:30 am shall not be allowed to sit in Paper 2 and candidate report after 2 pm shall not be allowed to sit in Paper 1. The CTET Admit Card will have the following details. The candidates should check all these information carefully. If any discrepancies related to the particulars in the Admit Card of CTET is found, should be immediately reported to the authority. You can download CTET Admit Card 2016 from approximately one month before the exam date. 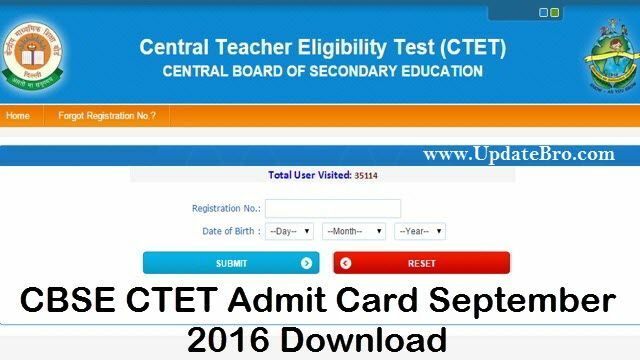 To download admit card of CTET September 2016, it is expected that you will need to enter registration ID and date of birth. If there is any discrepancy in the photograph / signature or other details of the hall ticket, contact CBSE immediately. On the day of exam, bring your CTET September 2016 admit card along with photo identification proof. Stay tuned to this website for more details regarding CBSE CTET September 2016 Results, answer key, cut off marks, results, merit list, counselling dates etc. Hope you like this CBSE CTET September Admit Card 2016 Free Download. If you like this please share it to your friends who are eagerly waiting to download the Hall Tickets of CBSE CTET Sep 2016.